Interested in learning more about this ancient Polynesian sport of kings that is spreading around the world? You too can have a chance to paddle an outrigger canoe at the Hawaiian Airlines Liberty Challenge. 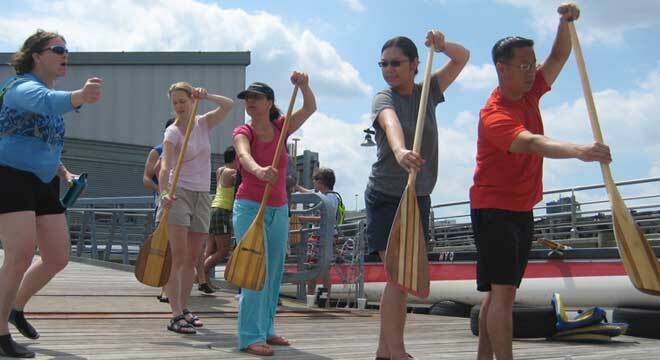 New York Outrigger will be offering its popular free summer novice program at this year’s race. Available for those 14-years-old and above, get a taste of what manner of the race participants have been training for. Learn about the history of the canoe and the sport, what makes the outrigger canoe unique, its surfing capabilities and open ocean navigating, the roles of each of the six paddlers in each seat and how to paddle. Following this training on land, you will have your opportunity to paddle one of our six-person canoes with experienced crew members from New York Outrigger. Get a unique view of Manhattan, the Statue of Liberty, the Hudson River and New Jersey from the vantage point of a few feet above the water and see the race up close. Our group of experienced instructors begin with the basics on land to familiarize you with the different functions and elements of the outrigger canoe, the mechanics of the stroke, the calls and commands, and the safety protocols. This is followed by a half hour session on the water with a group of our experienced paddlers that will allow you to practice what you have learned on land and continue with additional instruction. We will provide the paddles and the personal flotation devices. All you need to bring are clothes you are not afraid to get wet, some water to bring in the boat and sunscreen. The full Novice Sessions will take about 1 hour. The sessions take place at the east end of Pier 26 in Hudson River Park located at North Moore Street and West Street just north of the World Trade Center on the Hudson River. The novice sessions are completely free, although a donation that would go towards supporting New York Outrigger’s Novice Program which provides free recreational opportunities for any resident of the tri-state area is greatly appreciated. Should you wish to donate, you can make a donation here, or you can give your donation to your instructor at your novice session. You are welcome to take up to three novice sessions, at which point, we welcome you to join our organization so that you may continue paddling with New York Outrigger for the remainder of the season. As a paid member, you may join in on any of our organized OC-6 practices which are held throughout the week, have access to our small boat fleet (after taking our small-boats orientation) and join in on NYO’s various paddling clinics and training sessions. OUTRIGGER PADDLING IS A GREAT WORKOUT! You should be in generally good health and capable of performing moderate intensity exercise or cleared by your doctor to participate in this level of activity. Paddling an outrigger canoe requires a degree of effort and concentration that you should be prepared for. This is not a leisurely paddle. For your own safety and those in your crew, we have set the following requirements. All participants must be at least 14 years of age. You must know how to swim and/or tread water. Head to the New York Outrigger Welcome Tent to sign up for your novice session. Sessions are on a first-come-first-serve basis. Each session is limited to 3 novices per canoe. For safety reasons, we couple an experienced paddler with a novice paddler. For more information, please contact us at novice@newyorkoutrigger.org.